Fromm Four-Star offers your dog the variety they deserve. We've designed our entire line to compliment one another allowing you to switch between and combine recipes. Your dog's dining experience will never be the same again. 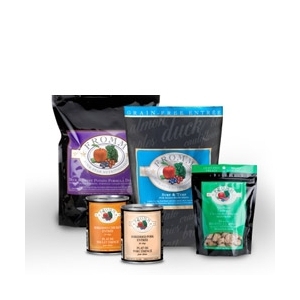 Dry recipes are prepared in small batches with fresh ingredients delivered daily, our Four-Star dry recipes for dogs offer the highest inclusion levels of meat, fish, fresh fruit, and fresh vegetables. Can recipes are the perfect compliment to our dry recipes or a rich savory meal by themselves. Available in three shredded varities.